Almost everyone, at some point in their lives, has signed a pre-injury release contract. These are the forms that you must sign before you do things like go skiing, rent a boat, jump at a trampoline park, rent a raft or inner-tube for floating, go scuba diving or parachuting. It is the form that basically states that the consumer cannot sue the provider of the activity or equipment, even if the provider’s negligence causes injuries to the consumer. It is generally true that people don’t really read these contracts until after they are injured. These pre-injury releases serve two purposes for businesses; 1) the release provides a strong deterrent to consumers who are injured by the provider from seeking redress; and 2) in some cases, the releases are deemed valid and are used to defend lawsuits. However, these releases are far from infallible and many contain mortal defects that do not prevent a valid claim from being enforced against a provider. This post will outline the state of pre-injury releases in Texas. There are some claims that cannot be waived in Texas. Employees cannot waive a cause of action against his/her employer (in cases where the employer provides no workers compensation insurance). This is a statutory rule that can be found in the Texas Labor Code, Section 406.033(e). Additionally, Texas public policy prohibits releases that purport to release conduct that rises to the level of “gross negligence.” In cases where a consumer is injured by the “gross negligence” of a vendor, a pre-injury release does not shield the vendor from responsibility. “Gross negligence” is defined in the Texas Civil Practices and Remedies Code in Section 41.001(11) as “an act or omission: (A) which when viewed objectively from the standpoint of the actor at the time of its occurrence involves an extreme degree of risk, considering the probability and magnitude of the potential harm to others; and (B) of which the actor has actual, subjective awareness of the risk involved, but nevertheless proceeds with conscious indifference to the rights, safety, or welfare of others.” In real life, gross negligence is whatever a jury determines it is in a specific case. The final area where a pre-injury release is prohibited is for children. Texas case law has held that a parent cannot waive a potential future claim for his or her child. See Munoz v. II Jaz Inc., 863 S.W.2d 207 (Tex. App.—Houston 1993) and Paz v. Lifetime Fitness, Inc., 757 F. Supp.2d 658 (S.D. Tex 2010). Further, children cannot enter into a contract in Texas. What this means is that the release that parents sign for their kids at amusement parks, trampoline parks and skating rinks, etc., in Texas, are not worth the paper that they are printed on. Further, it means that vendors in Texas have no way of limiting their liability against children. Any vendors that require pre-injury releases for children are merely using the releases for deterrent purposes. Now that we have discussed the claims that cannot be waived in Texas, let’s discuss the release requirements for the claims that can be waived. 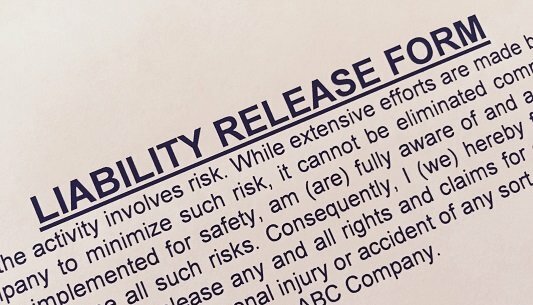 In Texas, a valid pre-injury release must meet the fair notice requirement. Fair notice requires that the release complies with the express negligence doctrine and the conspicuousness doctrine. Let’s break these down one by one. The express negligence doctrine requires that a release must contain a vendor’s unambiguous intent to be released of its own future negligence. The express negligence doctrine also requires that the release provide notice to the consumer of the potential claims that he/she is releasing. Put more simply, the release must inform the consumer of the potential risks that he/she faces and that the consumer is waiving any claim that may arise, even if the injury is caused by the vendor’s negligence. The conspicuousness requirement for releases requires that the language in the release that deals with the waiver of a vendor’s negligence must appear in a way that would cause a reasonable person to look at it. The Texas Business and Commerce code, Section 1.201(10) defines “conspicuousness” as “so written, displayed, or presented that a reasonable person against which it is to operate ought to have noticed it. Whether a term is "conspicuous" or not is a decision for the court. Conspicuous terms include the following: (A) a heading in capitals equal to or greater in size than the surrounding text, or in contrasting type, font, or color to the surrounding text of the same or lesser size; and (B) language in the body of a record or display in larger type than the surrounding text, or in contrasting type, font, or color to the surrounding text of the same size, or set off from surrounding text of the same size by symbols or other marks that call attention to the language.” Simply put, the language of the release that waives all claims for negligence must stand out to the naked eye. Besides the exceptions listed above, there seems to be no limit in Texas as to the claims that can be waived, pre-injury. This wide latitude that is granted to businesses certainly raises some red flags. For instance; could a supermarket require its customers to sign a release before grocery shopping? Could a doctor require that patients sign a release waiving any medical malpractice claims before treating them? Could an automobile dealer require customers to sign a release waiving any claims for dangerously designed or improperly manufactured/assembled vehicles before purchasing an automobile? Pre-injury releases pose the danger of completely preventing marketplace accountability. Recently, I have been approached by several potential clients with meritorious claims that were hesitant to seek help from an attorney because they signed a pre-injury release. However, as you can see from this article, many such releases are unenforceable. In fact, it is accurate to state that the most useful thing that pre-injury releases do is merely deter injured people from pursuing claims. If you have questions regarding the validity of a pre-injury release, please contact an attorney at our law firm at 512-562-7000 or mbe@elyreed.com.